Martha Berry clears up the confusion about the donations of Mr. Ford. Mary Smith would like Martha Berry to clear up rumors about a huge donation made by Mr. Ford. 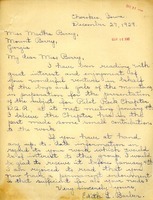 Mrs. Scofield has to give a talk at a DAR meeting and was hoping to be sent some relevant data about Berry, a copy of the booklet "The Sunday Lady", and some pictures of Martha Berry at the school. 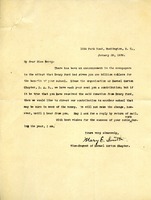 Lena F. Barnes writes to say that her DAR chapter will be pleased for Martha Berry to take part in their program, unless to do so would go against doctor's orders, in which case they would be glad to receive Inez Wooten. 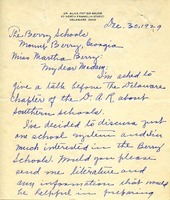 Someone from the Betty Bonney Chapter of the DAR is informing the Berry Schools of the new regent of the Arkansas City, Kansas chapter is Mrs. J. H. Bards. 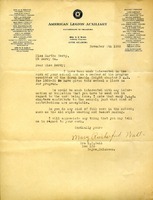 Mrs. Hazel H. Wallace again asks Martha Berry if she will be able to attend the D.A.R. meeting in Roselle, New Jersey on March 11th. 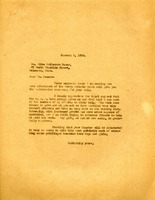 Mrs. Wallace asks for leaflets regarding the Berry Schools as she has a paper on various DAR schools. 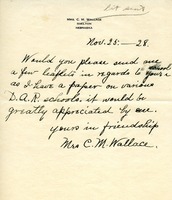 Wallace requests a visit from Berry along with "the very attractive young person who was with you last Spring." 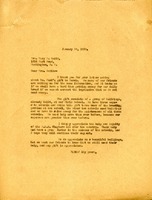 Letter to Martha Berry from Mrs. E. E. Wall. 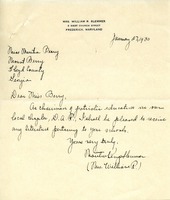 The letter is informing Miss Berry that the Sarah Kemble Knight chapter of DAR has included the Berry Schools on their program. 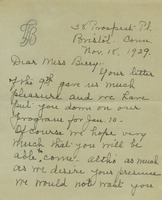 Mrs. E. E. Maxwell would like more information and materials about the Berry Schools.